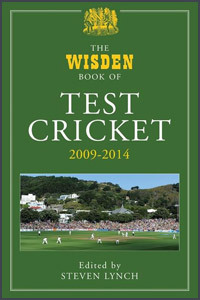 Another superb reference book, in the secure hands of Steven Lynch, brings Test cricket up to date for the fan of the longest version of the game and, in Wisden’s reference books on Test history, all games are now covered until September 2014. According to my mentor and guru, Bill Frindall, who compiled previous editions including a triumvirate up to and including 2000, one of the occupational hazards of such reference books is that, once published and in bookshops, the books can already be out of date, Tests having been played in the meantime. It is true that the most up to date statistical information can be found quickly on the likes of Cricinfo’s website but, for devoted fans, there is nothing finer than having the whole chronological history of Test cricket history displayed proudly on a bookshelf of a private collection. Carrying the name of Wisden also. We should be very grateful to Steven Lynch for producing the most recent volumes since 2000. Maintained in similar style to the earlier editions which I have mentioned, there is so much of interest. The match reports – taken from Wisden – give some fascinating statistics. Statistics which might make the reader sit up and take notice. Such reference books can realistically only give more general player career statistics but the reports undoubtedly add much to the enjoyment of the book. Another interesting point I noticed was in the naming of players making their debut. Granted, this has always been the case in previous editions but, occasionally, accompanying notes have helped greatly. For example, Test 2008 – albeit in the season 2011/12 – mentions one A.N.P.R. Fernando having made his debut for Sri Lanka. Many of us have heard of Nuwan Pradeep but can we all say that, given his full name, we would recognise him as the same player? The short, bracketed note after his full name mentioning that he is usually known as Nuwan Pradeep is undoubtedly helpful. All devoted fans will be very grateful to Steven Lynch for overseeing the latest edition of The Wisden Book of Test Cricket and the book is a must for any serious cricket collector.